Four versions of the 2011 MSDI featuring various adjustments were tested to assess its quality and to identify the most comparable and accurate version for longitudinal analyses. Differences between versions proved to be minimal. The version without any adjustments produces similar results to the other versions. It was selected as the simplest and easiest to compare to previous indexes. The 2011 MSDI update delivers very satisfactory results for the various analyzed criteria, but requires a complex and lengthy procedure needing the collaboration of Statistics Canada for use of their master file. 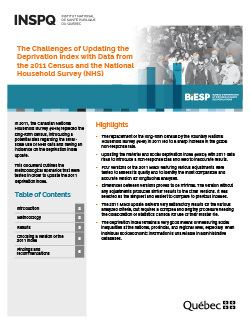 The deprivation index remains a very good means of measuring social inequalities at the national, provincial, and regional level, especially when individual socioeconomic information is unavailable in administrative databases.